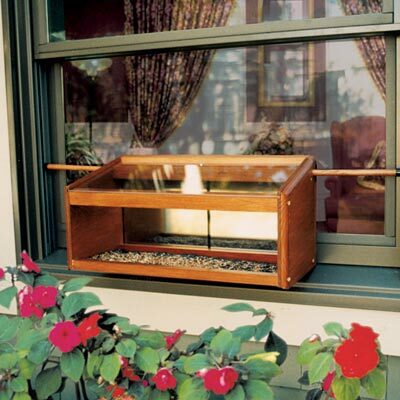 Invite birds to dine near you using the Coveside Windowsill Bird Feeder with Mirrored Back. This stylish feeder rests on your windowsill, for up close birding action. Mahogany dowels insert into holes on the sides of the item, and an internal spring holds them in place in windows from 22" to 38" wide. Two acrylic panels create a back on the item, which slides open in the center for easy refilling and cleaning. These panels have a mirrored finish on the exterior, so birds cannot see in but you can watch them with ease. A clear plastic top offers a different view, for added birding enjoyment. The bottom of the feeder is crafted from metal screen, holding 1.5 quarts of seed and offering a safe place for birds to rest. The screening also allows water to drain, and the wooden frame keeps all seed in place. The soft brown hue of the wood also adds a lovely hint to the piece. Enjoy bird activity nearer to you with this Windowsill Bird Feeder with Mirrored Back. Made in the USA.